Roughnecks from the East Texas oilfield rushed to New London school after the March 18, 1937, explosion – and searched for survivors throughout the night. Photo courtesy New London Museum. At 3:17 p.m. on March 18, 1937, with just minutes left in the school day and more than 500 students and teachers inside the building, a natural gas explosion leveled most of an East Texas school. Hundreds died at New London High School in Rusk County after odorless natural gas leaked into the basement and ignited. The force of the explosion was felt even four miles away. Parents, many of them roughnecks from the East Texas oilfield, rushed to the school. Despite immediate rescue efforts, 298 died, most from grades 5 to 11 (dozens more later died of injuries). They are remembered today at the New London Museum. A young man working for United Press in Dallas, Walter Cronkite, was among the first reporters to reach the scene of the disaster south of Kilgore, between Tyler and Longview. It was dark and raining. “He got his first inkling of how bad the incident was when he saw a large number of cars lined up outside the funeral home in Tyler,” notes one local historian. At the scene, floodlights cast long shadows. The explosion hurled a concrete slab 200 feet onto a 1936 Chevrolet. Rusk County, Texas, had one of the richest rural school districts in the United States. On March 18 students were preparing for the next day’s Inter-scholastic meet in Henderson. Photos courtesy New London Museum. David M. Brown, who researched the tragedy for a 2012 book, described the “sad irony” of how the East Texas oil boom financed building the wealthiest rural school in the nation in 1934 – and the faulty heating system that permitted raw gas to accumulate beneath it. According to Brown, it was partly the result of school officials making a bad decision. To save money on heating the school building, the trustees had authorized workers to tap into a pipeline carrying “waste” natural gas produced by a gasoline refinery. “The resulting explosion that laid waste to a town’s future,” he concluded in his book Gone at 3:17, the Untold Story of the Worst School Disaster in American History. Following the disaster, a temporary morgue was set up near the school as well as nearby Overton and Henderson, noted Robert Hilliard, a volunteer for the New London Museum. “Many burials were made in the local Pleasant Hill cemetery that to this day, still symbolize the great loss that families endured, added Hilliard, among those who have maintained the museum’s website. As a result of the disaster, Texas was the first state to pass laws requiring that natural gas be mixed with a “malodorant” to give early warning of a gas leak. Other states quickly followed. A granite cenotaph was dedicated in 1939 to the more than 300 students and teachers who perished. Today, the rotten-egg smell associated with natural gas is Mercaptan, the odorant added to indicate the potentially dangerous leaking of gas. New London’s community museum, across the highway from the school site, began in 1992 thanks to years of work by its founder and first curator, Mollie Ward, who was 10 when she survived the devastating explosion. Ward noted in a 2001 interview that among the museum’s exhibits was a blackboard found in the rubble. “Sometime in the night a worker found a blackboard that had been on the wall that read ‘Oil and natural gas are East Texas’ greatest mineral blessing,'” said Ward, who spent years helping start a former students association that reunited survivors of the New London explosion. The New London Museum includes extensive personal accounts of the tragedy taken from newspaper articles and personal interviews. Considered state-of-the-art for its time, the school housed grades K-11. One museum exhibit is a recovered blackboard that reads: “Oil and natural gas are East Texas’ greatest mineral blessing.” Photo by Bruce Wells. Near the museum is a 32-foot-high granite cenotaph dedicated in 1939. In December 1938, a contract for building a monument was awarded to the Premier Granite Quarries of Llano, Texas. Donald Nelson of Dallas was appointed designing and supervising architect for the project. After a competition in which seven Texas sculptors submitted preliminary models, Herring Coe of Beaumont was awarded the task of making the model for the sculptural block at the top. A 20-ton sculptured block of Texas granite – supported by two monolithic granite columns – depicts twelve life-size figures, representing children coming to school, bringing gifts and handing in homework to two teachers. Discovered in 1928, the giant Oklahoma City oilfield added stability to the state’s economy during the Great Depression. This field alone produced more than 7.3 million barrels of oil over the next 40 years. Photo courtesy Oklahoma Historical Society. The Nellie Johnstone No. 1 well in April 1897 made Oklahoma oil history as its first discovery – and attracting hundreds of exploration companies to Bartlesville in what was then Indian Territory. In addition to attracting exploration companies, Oklahoma’s drilling booms brought traffic jams, including this one in Seminole, Oklahoma, circa mid-1920s. Photo courtesy Oklahoma Oil Museum. Oklahoma oil history began when exploration companies rushed to Indian Territory in 1897 after a column of oil erupted from a well near Bartlesville, a small town on the Caney River just south of the Kansas border. These “wildcatters” often used steam boilers to power heavy cable tools for Making Hole – Drilling Technology. It was a technique that had evolved from using a spring pole to drill brine wells for making salt. The 1897 Bartlesville oil gusher, which came a decade before statehood, was the First Oklahoma Oil Well, although some historians maintain a well drilled a decade earlier should be considered as Oklahoma’s Other First Oil Well. More oilfield discoveries quickly followed, each making national headlines and attracting investors seeking riches in Mid-Continent black gold. Adding to the region’s oil fever, the 1901 Red Fork Gusher launched another historic drilling boom, soon Making Tulsa “Oil Capital of the World.” When Missouri investors saw opportunities in the oilfields at the Kansas-Oklahoma border, they formed Cahege Oil & Gas Company. Following statehood in 1907, more major discovers made the Sooner State famous worldwide. More than 50 refineries once operated in the Cushing area about 50 miles west of Tulsa. Pipelines and storage facilities have since made it “the pipeline crossroads of the world.” Photo from Cushing oilfield, 1910-1918, courtesy Oklahoma Historical Society. In March 1912 near Cushing, the Wheeler No. 1 wildcat well produced 400 barrels a day from less than 2,350 feet deep. It marked the first of many oil gushers by an independent oilman once known as Thomas “Dry Hole” Slick. An historic marker commemorates the August 9, 1921, field testing of seismic technology. The site is located on I-35 about halfway between Oklahoma City and Dallas. Tom Slick would begin an 18 year streak of discovering some of America’s most prolific oilfields – and become known as Oklahoma’s King of the Wildcatters. In 1915, the Bartlesville-based Cities Service Company subsidiary discovered the 34-square-mile El Dorado oilfield in Kansas. In 1928, another subsidiary, Empire Oil & Refining, discovered the Oklahoma City oilfield. Thanks to a University of Oklahoma physicist, new earth-science technologies like reflection seismography began revolutionizing petroleum exploration in the 1920s. J.C. Karcher’s methods evolved from efforts to locate enemy artillery during World War I. He measured the first reflection seismograph geologic section during an experiment near Ardmore in 1921. By the 1920s, auctions for Osage Nation mineral leases took place in the shade of a Million Dollar Elm near Pawhuska. Oil production Osage oilfields launched the careers of industry leaders like Frank Phillips, J. Paul Getty, Bill Skelly, E.W. Marland and Harry Sinclair. South of Oklahoma City, the 1926 oilfield discovery at Seminole launched the Greater Seminole Oil Boom. More than 60 petroleum reservoirs were found in 1,300 square miles of east-central Oklahoma – and seven were giants, producing more than a million barrels of oil each. Col. William F. “Buffalo Bill” Cody’s legacy extends beyond his Wild West show. A Wyoming town named for him preserves his Big Horn Basin heritage. Lesser known is his brief exploration into the oil business. “It would be hard to imagine the history of Wyoming around the turn of the 20th century without Buffalo Bill,” notes one historian. 1915 photo courtesy Buffalo Bill Center of the West. In his day, “Buffalo Bill’s Wild West and Congress of Rough Riders of the World” made W.F. Cody the most recognized man in the world. His fanciful Indian attacks on wagon trains, the marksmanship by Annie Oakley, and other attractions drew audiences in America and Europe. Cody became a promoter of the Wyoming frontier town he helped found in 1896 that bears his name. The local newspaper he and a partner started in 1899 is still publishing today. The Cody Enterprise continues to acknowledge W.F. Buffalo Bill Cody on its masthead. A “Buffalo Bill Wild West show circa 1899” poster by Courier Lithographing Co., Buffalo, N.Y., shows cowboys rounding up cattle and a portrait of Col. W.F. Cody on horseback. Image courtesy Library of Congress Prints and Photographs Division. As a partner in the Shoshone Land and Irrigation Company, he enticed the Chicago, Burlington and Quincy Railroad to build an extension from Toluca, Montana, to Cody to ensure future growth and prosperity in the Big Horn Basin of north-central Wyoming. W.F. “Buffalo Bill” Cody, right of center in black hat, and other investors at an oilfield on the Shoshone Anticline near Cody, Wyoming, around 1910. Photo courtesy the American Heritage Center, University of Wyoming. Always an entrepreneur, the showman had earlier formed the W.F. Cody Hotel Company when the railroad reached Sheridan, about 150 miles east of Cody, in 1892. He opened the Irma Hotel (named after his daughter) in Cody in 1902. Historian Robert Bonner notes that the veteran showman promoted his enterprises endlessly with anyone who would listen. Founded in 1934, the Dallas Petroleum Club witnessed the city becoming a financial center for the Texas petroleum industry, notes author Nina P. Flournoy. The historic club recently published her book to mark its 80th anniversary. Dallas-based Flournoy’s book, The Lions Among Us: Celebrating 80 Years of The Dallas Petroleum Club describes how the club grew out of 1930s East Texas discoveries that ignited the Texas oil and natural gas industry. Founded in 1934, the club witnessed the city becoming a financial center for the Texas industry. A marker on Route 22 at Murrysville, Pennsylvania, commemorates the Haymaker brother’s historic natural gas well of 1878. In 1878, the Haymaker brothers discovered a Pennsylvania natural gas field near Pittsburgh – and laid the foundation for many modern petroleum companies. Like many young men of their time, Michael Haymaker and his younger brother Obediah had left their Westmoreland County farm to seek their fortunes in Pennsylvania’s booming petroleum industry. Cochrane, a longtime member of the American Association of Petroleum Geologists, and former editor of “The Shale Shaker,” the journal of the Oklahoma City Geological Society, continues to work as a consulting geologist in his coastal region of Northern California. Cochrane is in his 80s. The former teacher also is author of Shaping the Sonoma-Mendocino Coast – Exploring the Coastal Geology of Northern California, a regional bestseller. The largest U.S. private oil lease ever negotiated was signed in 1933. The 825,000 acre King Ranch oil deal with Humble Oil and Refining will lead to ExxonMobil. The agreement, which has produced more than $1 billion in royalties, has been extended ever since. Well known in 1957, Robert Kleberg, the grandson of ranch founder, Richard King, made hundreds of millions of dollars in royalties from his grandfather’s 1933 lease deal. Despite dry holes drilled more than a decade earlier, a geologist convinced his petroleum company to further explore a big ranch in South Texas. At one point covering one million acres, King Ranch today is still bigger than the state of Rhode Island (776,960 acres). According to the Texas State Historical Association, King Ranch began in 1852, when Richard King and Gideon Lewis set up a cattle camp on Santa Gertrudis Creek southwest of Corpus Christi. The ranch expanded into Nueces, Kenedy, Kleberg and Willacy counties. Its Running W brand appeared in the 1860s. King Ranch became famous for its Texas longhorn cattle. Petroleum exploration there began as early as 1919. Exploratory wells drilled by a future major oil company – the largest in the America – were dry holes. With no discoveries by 1926, the company let its lease expire. Years would pass as new exploration and production terms were negotiated. “Agreement was not reached until 1933 because Humble’s top management was uncertain about the oil potential of this part of Texas,” explains a 2010 article by John Ashton and Edgar Sneed. Company geologist Wallace E. Pratt finally convinced Humble Oil and Refining President W. S. Parrish to lease the King Ranch for $127,824 per year, plus a one-eighth royalty. Humble Oil and Refining Company’s first home office was built in 1920 at Main and Polk streets in downtown Houston. The petroleum lease, signed on September 26, 1933, will bring wealth to both the ranch and the young petroleum company. Subsequent leases from neighboring ranches gave Humble Oil and Refining nearly two million acres of mineral rights between Corpus Christi and the Rio Grande River. The first successful oil well on the King Ranch was completed in 1939. “Drilling was minor until 1945, when the Borregas oil field was discovered,” note Ashton and Sneed in their Handbook of Texas Online King Ranch article. “After that, several major oil and gas discoveries were made on the ranch, where in 1947 Humble operated 390 producing oil wells,” they add. The company constructed a refinery in Kingsville to handle its growing oil production in South Texas. By 1953 King Ranch had 650 producing oil and natural gas wells. In 1980 a subsidiary – King Ranch Oil and Gas – was formed to conduct exploration and production in five states and the Gulf of Mexico. Eight years later the company sold its Louisiana and Oklahoma holdings to Presidio Oil for more than $40 million. “In 1992 King Ranch Oil and Gas was one among several companies to discover natural gas off the coast of Louisiana,” conclude Ashton and Sneed. “By 1994 the King Ranch had received oil and gas royalties amounting to more than $1 billion since World War II,” they add. Humble Oil and Refining Company will consolidate operations with Standard Oil of New Jersey. By the 1950s it merges operations with Esso, leading to Exxon. Today, as ExxonMobil, the company continues to extend the King Ranch lease agreement that has been in effect since September 1933. “The King family became the closest thing to royalty in Texas,” Nanette Watson proclaims in her April 2012 article in Houses with History. Watson also says the family’s “destined for greatness” legacy was portrayed in the 1956 Hollywood epic Giant, starring Elizabeth Taylor, James Dean and Rock Hudson. Although the rancher (Hudson) and the roughneck (Dean) are thrown into conflict prior to an oil gusher, by the time the movie was made, well control had been around more than 30 years. See Ending Oil Gushers – BOP. As production technologies evolved after World War II, Lane-Wells developed a downhole gun with the explosive energy to cut through casing. Above, one of the articles preserved in a family scrapbook, courtesy Connie Jones Pillsbury, Atascadero, California. About 15 years after its first oil well perforation job, Lane-Wells Company returned to the same well near Motebello, California, to perform its 100,000th perforation. The publicity event of June 18, 1948, was a return to Union Oil Company’s La Merced No. 17 well. It was a colorful ceremony, according to at least one trade magazine. Walter Wells, chairman of the board for Lane-Wells, was present for both events. The article reported he was more anxious at the first, which had been an experiment to test his company’s new perforating gun. In 1930, Wells and another enterprising oilfield tool salesman, Bill Lane, came up with a practical way of using guns downhole. They envisioned a tool which would shoot steel bullets through casing and into the formation. The two men created a multiple-shot perforator that fired bullets individually by electrical detonation of the powder charges. After many tests, success came at the Union Oil Company La Merced well. As explained further in Downhole Bazooka, by late 1935 Lane-Wells had established a small fleet of trucks as the company grew into a leading provider of well-perforation services. What was needed was a high-powered gun for breaking through casing, cement and into formations. An oilfield worker, Sidney Mims, had patented a similar technical tool for this purpose, but could not get it to work as well as it could. Lane and Wells purchased the patent and refined the gun. Lane-Wells became Baker Atlas, which celebrated its 75 anniversay in 2007, and today is a division of Baker-Hughes, a GE Company. Established in Los Angeles in 1932, the oilfield service company developed a remotely controlled 128-shot gun perforator. “Lane and Wells publicly used the reengineered shotgun perforator they bought from Mims on Union Oil’s oil well La Merced No. 17. There wasn’t any production from this oil well until the shotgun perforator was used, but when used, the well produced more oil than ever before,” she explains in 75 Years Young…BAKER ATLAS The Future has Never Looked Brighter . The successful application attracted many other oil companies to Lane-Wells, which decided to conduct its 100,000th perforation 15 and a half years later at the same California oil well. The continued success led to new partnerships beginning in the 1950s. A merger with Dresser Industries was finalized in March 1956. Another merger came in 1968 with Pan Geo Atlas Corporation, forming Dresser Atlas. A 1987 joint venture with Litton Industries led to Western Atlas International, which became an independent company before becoming a division of Baker-Hughes, a GE Company in 1998. Baker Atlas today provides well logging technology and perforating services worldwide. The book has attendees’ signatures, photographs, and articles about the event (from TIME, The Oil and Gas Journal, Fortnight, Oil Reporter, Drilling, The Petroleum Engineer, Oil, Petroleum World, California Oil World, Lane-Wells Magazine, the L.A. Examiner, L.A. Daily News and L.A. Times). The children of Dale G. Jones and the grandson of Walter T. Wells have sought for an oil museum to preserve this family record. Contact the American Oil & Gas Historical Society for more information. Seventy-six feet tall and weighing about 22 tons, the “Golden Driller” – and oilfield roughneck – is the most photographed landmark in Tulsa, Oklahoma. Designated an Oklahoma state monument in 1979, the Golden Driller was permanently installed for the 1966 International Petroleum Exposition in Tulsa. 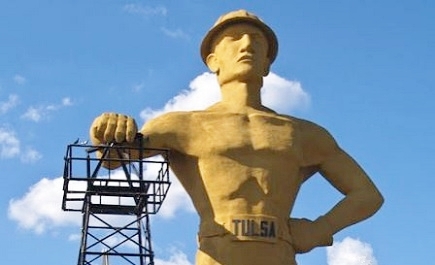 Tulsa and its Golden Driller have witnessed many booms – and busts – of the U.S. petroleum industry over the years. Originally sponsored in 1953 by the Mid-Continent Supply Company of Fort Worth, Texas, the giant proved very popular. So much so that a new version was temporarily erected again for the 1959 International Petroleum Exposition. The oilfield equipment expos will continue for decades at the Tulsa County Free Fair site, which began in 1903. The original Golden Driller of 1953, left, proved so popular that a smaller, rig-climbing version (called The Roustabout) returned for the 1959 International Petroleum Exposition. Images courtesy Tulsa Historical Society. Although again a temporary statue, the 1959 Golden Driller impressed visitors and exhibitors at the oil show. “This time he was much more chiseled and detailed and was placed climbing a derrick and waving,” notes a Tulsa Historical Society volunteer. Known as “The Roustabout,” the 1959 rig-climbing version again attracted so much attention that Mid-Continent Supply refurbished it and donated it to the Tulsa County Fairgrounds Trust Authority. “Over the next seven years he had a makeover, actually he had to be completely re-made to withstand the elements,” explains Nancy “Tulsa Gal” of the Tulsa Historical Society. Mid-Continent Supply Company constructed a permanent version in 1966 with steel rods to withstand up to 200 mph winds. Refurbished again in 1979, it was designated a Oklahoma state monument. Today’s Golden Driller was originally created for Tulsa’s 1966 International Petroleum Exposition. Its designer was a Greek immigrant named George “Grecco” Hondronastas, an artist who had worked on the 1953 expo statue. According to the 2014 article by Tony Beaulieu, Hondronastas was an eccentric and prolific artist who was proud of becoming a U.S. citizen through his military service in World War One. Beaulieu adds that “Hondronastas was always proud of designing the Golden Driller, and would tell anyone he met, according to his son, Stamatis Hondronastas.” Learn more in “An Oil Town’s Golden Idol,” originally published in This Land, Vol. 5, Issue 22, November 15, 2014. The giant has sported t-shirts, belts, beads and ties.This shirt is from the 2014 Tulsa State Fair and KMOD radio. Images courtesy the Tulsa Historical Society. The Golden Driller’s right hand rests on an old production derrick moved from an oilfield near Seminole, Oklahoma – which has its own extensive petroleum heritage. Fully refurbished in the late 1970s, the Golden Driller – by now a 43,500-pound tourist attraction – is the largest free-standing statue in the world, according to Tulsa city officials. “Over time the Driller has seen the good and the bad,” Nancy explains. “He has been vandalized, assaulted by shotgun blasts and severe weather. But he has also had more photo sessions with tourists than any other Tulsa landmark and can boast of many who love him all around the world,” she concludes. The Golden Driller, a symbol of the International Petroleum Exposition. Dedicated to the men of the petroleum industry who by their vision and daring have created from God’s abundance a better life for mankind. – Inscription on the plaque at the statue’s base. An unidentified model posed on one of the Golden Driller’s shoes, probably sometime during construction of the permanent version in time for the 1966 petroleum expo. A 2007 American Oil & Gas Historical Society Energy Education Conference and Field Trip in Oklahoma City included visits to museums in Seminole, Drumright and Tulsa – with a stop at the Golden Driller. Although the first International Petroleum Exposition and Congress had no giant roughneck statue in 1923, the expo helped make Tulsa famous around the world. In 1905 – two years before Oklahoma became a state – an oil discovery on the Glenn farm south of Tulsa brought the city’s first drilling boom. Learn more in Making Tulsa the Oil Capital. In perhaps the first raid on oilfield facilities in warfare, in the spring of 1863 a regiment of Confederate cavalry attacked the oil town of Burning Springs in what would soon become West Virginia. The rebel raiders destroyed equipment and thousands of barrels of oil. “The First Virginia (Rebel) cavalry at halt. Sketched from nature by Mr. A. R. Waud.” From Harper’s Weekly, September 27, 1862. Gen. Jones’ Brigade consisted of the 6th, 7th, 11th, 12th Virginia Cavalry Regiments and 35th Virginia Cavalry Battalion. The Burning Springs oilfield (at bottom) was destroyed by Confederate raiders in May 1863 when Gen. William “Grumble” Jones and 1,300 troopers attacked in what some call the first oilfield destroyed in a war. On May 9, 1863, the Burning Springs oilfield was destroyed by Confederate raiders led by Gen. William “Grumble” Jones. His brigade of Confederate cavalry attacked near the Ohio River in far western Virginia. This surprise attack along the Kanawha River marked the first time an oilfield was targeted in war, “making it the first of many oilfields destroyed in war,” said David L. McKain, a noted West Virginian petroleum historian and author. “After the Civil War, the industry was revived and over the next fifty years the booms spread over almost all the counties of the state,” explained McKain, who founded and an oil museum in Parkersburg (and was often seen in his black truck searching local valleys for rare oilfield artifacts). In May 1861, the Rathbone brothers use a spring-pole to dig a well at Burning Springs that reaches 303 feet and begins producing 100 barrels of oil a day. An oil boom soon follows. Almost a century earlier, George Washington had acquired 250 acres in the region because it contained oil and natural gas seeps. “This was in 1771, making the father of our country the first petroleum industry speculator,” noted McKain, author of Where It All Began, a history of the West Virginia petroleum industry. As early as 1831, natural gas was moved in wooden pipes from wells to be used as a manufacturing heat source by the Kanawha salt manufacturers. A thriving commercial oil industry grew in Petroleum and California – towns near Parkersburg. Then in 1861 at Burning Springs, the Rathbone brothers’ spring-pole oil well reached 303 feet – and began producing 100 barrels of oil a day. “These events truly mark the beginnings of the oil and gas industry in the United States,” said McKain, who died in 2014. Founded by oilman David McKain, the Oil and Gas Museum is near the Ohio River at 119 Third Street in downtown Parkersburg, West Virginia. As early as 1831, natural gas was moved in wooden pipes from wells to be used as a manufacturing heat source by salt manufacturers. “Drilling and producing of both oil and natural gas continues throughout the state to this day,” added McKain, founder of the Oil and Gas Museum in Parkersburg. The incredible wealth created by petroleum was key to bringing statehood for West Virginia during the Civil War, he claimed. “Many of the founders and early politicians were oil men – governor, senator and congressman – who had made their fortunes at Burning Springs in 1860-1861,” McKain explained. In 1863, President Abraham Lincoln issued a proclamation admitting the state on June 20. When Confederate Gen. William “Grumble” Jones and 1,300 troopers attacked Burning Springs in the spring of 1863, they destroyed equipment and thousands of barrels of oil. “The wells are owned mainly by Southern men, now driven from their homes, and their property appropriated either by the Federal Government or Northern men,” said Gen. Jones of his raid on this early oil boom town. All the oil, the tanks, barrels, engines for pumping, engine-houses, and wagons – in a word, everything used for raising, holding, or sending it off was burned. Men of experience estimated the oil destroyed at 150,000 barrels. It will be many months before a large supply can be had from this source, as it can only be boated down the Little Kanawha when the waters are high. The Oil and Gas Museum, maintained by volunteers, added a small museum at Burning Springs and a park at California, about 27 miles east of Parkersburg on West Virginia 47. In addition to Where It All Began, McKain published The Civil War and Northwestern Virginia – The Fascinating Story Of The Economic, Military and Political Events In Northwestern Virginia During the Tumultuous Times Of The Civil War. Formed by Harry F. Sinclair in 1916, Sinclair Oil is one of the oldest continuous names in the oil industry. The Sinclair dinosaur first appeared in 1930. “Dino” quickly became a marketing icon whose popularity with children – and educational value – remains to this day. Today known more correctly as Apatosaurus, in the 1960s a 70-foot “Dino” traveled more 10,000 miles through 25 states – stopping at shopping centers and other venues where children were introduced to the wonders of the Mesozoic era courtesy of Sinclair Oil. With $50 million in assets, Harry Ford Sinclair borrowed another $20 million and formed Sinclair Oil & Refining Corporation on May 1, 1916. He brought together a collection of several depressed oil properties, five small refineries and many untested leases – all acquired at bargain prices. In its first 14 months, Sinclair’s New York-based company produces six million barrels of oil for a net income of almost $9 million. The company’s refining capacity grew from 45,000 barrels a day in 1920 to 100,000 barrels in 1926. It reached 150,000 barrels in 1932. Sinclair Oil began using an Apatosaurus (then called a Brontosaurus) in its advertising, sales promotions and product labels in 1930. Children loved it. Lloyd N. Unsell (1923-2007), a founding member of the American Oil & Gas Historical Society, in 1986, he received the industry’s prestigious Chief Roughneck Award in 1986 — the only person not affiliated with an oil company to do so since the award began in 1955. He joined the Independent Petroleum Association of America in 1948 and soon managed public and media relations; he was promoted to executive vice president in 1976 and president in 1985. Unsell was part of key industry industry debates — and also helped win final approval for the Vietnam Veterans Memorial’s design and construction in 1982. In December 2004, Unsell gave AOGHS exclusive permission to publish the draft forward and early chapters of his then in-progress memoirs, Recollections of Lloyd N. Unsell. When I went to work on the Tulsa World, I learned very quickly what it meant to be a little frog in a big pond. The dynamics of downtown Tulsa were fascinating for a small town reporter. The Tulsa Chamber of Commerce stationary still proclaimed that the city it served was “The Oil Capitol of the World.” Houston may have been edging up on that claim, but all the elements on which Tulsa had based the title were still in place – headquarters for Skelly Oil Co., Carter Oil Co., the SONJ domestic production subsidiary, Stanolind Oil & Gas, the Standard of Indiana production arm, Mid-Continent Petroleum Corp., Service Pipeline Co., National Tank, Bovaird Supply, Hinderliter tool, Unit Rig, and production headquarters for a dozen other medium to large integrated companies. But Tulsa was also headquarters for dozens of highly successful independent oil companies, and managers of the hundreds of phone book listings of oil-related enterprises which were competing for space in the bristling downtown area where business offices were at a premium. Tulsa was headquarters for the then world’s largest commercial magazine, the Oil & Gas Journal which now only has a printing plant there, and a half dozen major industry associations. But one of the crown jewels of Tulsa’s claim as the major oil city was the International Petroleum Exposition (IPE) which had been a world renowned industrial exposition since 1923. When I arrived on the scene, feverish plans were already under way for the first postwar Exposition in May 1948, many months away. Tulsa had endemic housing and hotel room shortages, and an IPE Housing committee had been formed to find space for oil show visitors from 33 countries. It wasn’t going to be easy. Downtown Tulsa was a fascinating place in 1947. Major department stores and speciality shops lined Main Street and Boston Avenue for blocks, and shopping throngs crowded the streets on most days, giving the city the flavor of a bustling “big little town.” Great downtown theaters that matched any west of the Mississippi, particularly the Orpheum and the Ritz, attracted sellout throngs with long lines of movie-goers waiting for the next show. The downtown was blessed with eating establishments serving the after-theater crowds, and a favorite was Bishops, a spotless eatery open 24 hours, seven days a week. So popular was this restaurant that it almost always had lines of waiting patrons. Some of its waitresses were institutions, on their jobs there for decades. The Tulsa World and the competing Tulsa Tribune both had daily oil pages, but neither had a business page. The two papers’ oil editors, Paul Hedrick at the World and Andrew Rowley at the Tribune were known to everyone in the Tulsa oil community, and had no problem filling their respective spaces with industry developments fresh to their readers. I was a assigned a “beat” that included the local banks, travel organizations, the railroads and airlines all of which had busy downtown offices competing for the patronage of the traveling public, and represented the World at the weekly luncheon meeting of the Chamber of Commerce Board of Directors, to cover anything of interest on which the group may act. My earlier oil experience had consisted of lowest echelon work as an oilfield truck swamper, floor hand on oil well servicing rigs, and a small cog position in manufacturing oil tools at the Hinderliter plant in Tulsa. Now, I was getting to know some of the leading lights in the management of production operations of some of the largest oil companies in the land, exposed to their personalities, and learning about their backgrounds and experiences in the industry. Oil and gas leaders indeed were dominant in the Tulsa business community, and in the forefront of civic and business organizations in the city. It was my good fortune to get to know many of them well. When I moved to Tulsa, Skelly Oil Co. was a familiar name, not because I was a customer, because I didn’t own a car, but because a family friend had operated a Skelly service station in Seminole. The name W. G. (Bill) Skelly, however, meant nothing special to me, though to every long-term Tulsa resident he was known as the city’s top booster, and to many as “Mr. Tulsa.” Before long I would come to learn that Skelly earned that title because he simply loved the City of Tulsa, and for years had sought to express this affection in many visible ways. Tulsa was making great plans to host the first post-war International Petroleum Exposition (IPE) scheduled in May of 1948, and the President of IPE since its founding in the 1920’s, W. G. Skelly, was worried. The IPE housing bureau had rapidly run out of hotel space, and many Tulsans had discovered they could schedule vacations during the “oil show” and rent their homes to exhibitors, oil companies and foreign visitor delegations for good money. Trouble was, this opportunity was becoming too much of a “good thing” to some folks, and Mr. Skelly’s phone and post office box were overloaded with complaints of outlandish demands being made by some who apparently were determined to “get rich” renting their homes to oilmen. It nettled Skelly that anyone living in Tulsa would make demands that would “alienate our visitors to the city,” so he called the Tulsa World seeking its support in appealing to the “civic conscience” of Tulsans to treat prospective oil show visitors as they would wished to be treated. I was sent to interview Skelly and do this story. I told Mr. Skelly he had given me one paragraph, and that we needed to discuss the problem at some length so I could get the feel of it, and develop his philosophy about it since he was so incensed about the problem. He had other things to do, and saw little need of this extended conversation, but agreed, so he responded to my questions for the better part of an hour. Mr. Skelly was a curious interviewee. He was bald, for the most part, with wisps of hair above both ears, had a very large head with an oversized W. C. Fields nose, astride which sat heavy thick-lense eyeglasses. To a visitor, the thick glasses magnified his eyes which appeared to be enormous, a little bulgy, and somewhat rheumy. He had a nervous habit of quickly stroking the side of his nose with the knuckle of his index finger, sniffing as he did so. He always stroked his nose twice, and sniffed twice, simultaneously, while making a point in the conversation. When he thought I had notes enough to do the story, he said so, and dismissed me when his secretary announced that a visitor with an appointment was cooling his heels in the anteroom. I went back to the World newsroom, itself a little antiquated in those days. Every reporter used an old Underwood upright, any one of which could be heard on the street. All of them going at once created an indescribable racket, augmented by the clacking of a half-dozen AP teletype machines along one wall. To make matters worse, the city editor, Loren Williams, was near deaf (no doubt because of all the racket) and kept a police radio receiver on the wall behind his desk blaring at full volume. As a defense mechanism, I learned to consciously shut out all this tumult when I was concentrating on a story at deadline, and the habit sticks to this day. I called the oil show office, and got a few examples of complaints about excessive rental demands, then went to work on the story. It was late morning on Friday and relatively quiet when I finished W. G. Skelly’s appeal to Tulsans not to abuse the pocketbooks of visitors to the much-heralded oil show, still many months away. I roughly edited the article, pasted the succeeding pages together which was the practice in those non-computerized days, tossed it into the city editor’s in-basket, and went off to cover my regular news beat. I said I had several stories to write, and feeling a little offended by Erhard’s suggestion, I said if he wanted. Skelly to read the piece, he should send it over by a copy boy. Erhard wasn’t persuaded. “Look,” he said, “Mr. Skelly is a special person in this city. If he wanted to add something to the story, the guy who wrote it ought to be there. So as a personal favor to me, take it over and let him read it.” There was a note of finality in his voice, as he handed me the copy. The president of Skelly Oil Company looked at me for a long, tortuous moment, while I was biting my tongue at having made such a petty remark. “Just a minute,” he said. He pulled out a drawer of his desk, rummaged around in it a moment, then handed me a misshapen brown nut. “Put this in your pocket,” he said, “and rub it now and then for luck.” Not knowing what he had given me, I dropped it into my pocket, thanked him, and departed. had absolute faith that the buckeye seed was a working good luck charm. This was before television found its way to Tulsa, but Mr. Skelly owned radio station KVOO, where perhaps the only broadcast “celebrity” other than Bob Wills was Sam Schneider, the farm editor. Sam had an early morning broadcast which had an enormous following among farmers all over the southwest, since KVOO had 50,000 watts of clear channel power. Sam was in constant demand as a speaker before farm groups, knew what he was doing, and was an all-around nice guy. I was already beginning to learn that not many people said “no,” arbitrarily, to Mr. Skelly. “I suppose so,” I said again. “Good,” he said. “the planning group meets at my house, sometimes every week. You must attend those meetings. My secretary will advise you.” He hung up the phone. Mr. Skelly’s home, built in the teen years of the 20th century as I recall, suited him perfectly. It was furnished in turn-of-the-century decor, one memorable example a massive teakwood dining room suite. The chair backs, hand carved, featured elephants in a curved line up both sides, the elephants increasing in size as both lines met at the center top of the massive chairs. I was told that Mr. Skelly personally bought the suite in India. The elephant motif was well-suited to him; he had been a Republican national committee member for as long as anyone could remember. The stock show group met in the basement, where a huge table had been set up conference style. Two of the principals were Jay P. Walker, founder of the National Tank Co. who had an Angus ranch west of Sand Springs, and J. W. Sharp, whose ranch was on Mingo road northwest of Tulsa. Sharp raised Herefords, as I recall. These meetings were run loosely, and one quickly got the impression that plans for the Tulsa stock show were being developed without a plan. The only thing certain about this project was that it was near to the heart of W.G. Skelly. More than once in these meetings, he would declare with complete confidence that one day the Tulsa stock show would be “bigger than the Kansas City Royal,” which, of course, was then, and still is the granddaddy of all stock shows. But Mr. Skelly had such uncompromising faith in Tulsa that he could not imagine the city not spawning and nurturing to greatness a stock show measuring up to his boundless vision. He had for years given dozens of 4-H Club youngsters their first purebred calf, from his own ranch along the Verdigris river. It was a certainty in his mind that Tulsa was destined to have a stock show that would incubate and encourage the rise of young and successful ranchers the length and breadth of the “Magic Empire” of which his beloved city was the hub. I recall that the central subject of the first meeting I attended was “money.” There wasn’t any in the till, so plans were progressing to have a dinner in the Mayo hotel to which all the city fathers would be invited, there to be pep-talked on the grand vision of Tulsa’s first annual Fat Stock Show and Exposition, then appealed to for funds which were needed to open an office and hire an exposition manager. Somehow, I got the feeling that all this deadly-serious planning should have been started a year earlier, at least. There was so much to do; animal categories to be designated, premiums to be established, catalogs to be printed (not to mention distributed), ribbons printed, trophies designed and ordered, and on and on ad infinitum. I learned also at the first meeting what I suspected when I accepted the co-chairmanship of the “publicity committee.” Mr. Skelly advised that Charlie Border, who ran the agricultural department at the Chamber of Commerce in those days, had arranged a room complete with phone and typewriters where Sam Schneider and I could write the stock show publicity. I tried to reason privately with Mr. Skelly that I had a full-time job occupying me for l0-plus hours six days a week, and had little time to write press releases, work up newspaper mailing lists, and stuff envelopes, but he waved these protests off with assurances that it wouldn’t be that big a job. Sam Schneider and I quickly came to the conclusion that what Mr. Skelly expected of us was beyond our doing, but Sam was on wobblier footing than I because he worked for Mr. Skelly. So it fell to me to suggest hiring a part-time person to build and maintain mailing lists, write publicity, and do all the follow-up work that was needed. We found a woman who had been a reporter on the Tulsa Tribune, and had quit the newspaper to start a family. She agreed to work four to five hours a day, for a nominal $3 an hour. Mr. Skelly fumed about this, and argued that we could get a journalism student from the University of Tulsa for 50 cents an hour, pleading the poverty of the stock show coffers. But reasoning the thing through, showing that we clearly had much work demanding experienced help, we prevailed and hired the former reporter. I breathed a sigh of relief, and so did my wife who had developed disdain for two things: l) morning newspapers with midnight deadlines, and 2) “civic duty” as defined by W. G. Skelly. I forget the exact time, only that it was very cold, the night of the fundraising dinner held in a nice room on the mezzanine of the Mayo hotel, overlooking Fifth street. Jay Walker had arranged for special cuts of aged beef, and the Mayo supplied all the accompaniments. There were about 60 of Tulsa’s leading citizens there to be fed and solicited.. It was more than half a century ago, but I still remember a few of them: A. E. Bradshaw, chairman of the National Bank of Tulsa; R. Otis McClintock, president of the First National Bank; L. W. Grant, founder/president of Sooner Savings & Loan; R. W. McDowell, president of Mid-Continent Petroleum Corp., L. C. Clark of Clark-Darland Hardware (later to be mayor of Tulsa) C. H. Wright, founder of Sunray Oil, my boss Eugene Lorton, publisher of the Tulsa World, and others of similar stature. There were three people at the head table including Mr. Skelly and Jay P. Walker, a natural born promoter who was there to preside. The third person was the “show piece” of the evening, a young man named Ray Gene Cinnamon, a farm boy from the hamlet of Garber, OK., who had taken his prize steer to the Kansas City Royal, was awarded the grand championship for the animal, and in recognition of his achievement had been named “Star Farmer of America” by the Future Farmers of America (FFA). Jay Walker had found young Cinnamon and prevailed on him to come to Tulsa for the purpose of telling the city’s business luminaries what a wonderful thing they were about to do for young people like himself. Ray Gene didn’t disappoint. He said it was caring people just like those in his audience who had generated his interest in his life’s pursuit. Such men, through the Oklahoma State Fair at Oklahoma City, he said, had sparked the interest and shown the way to hundreds of young men then positioned to help elevate the quality of the livestock industry in Oklahoma. He said he couldn’t say enough for the wisdom of the men seated before him, for it was the interest of such men who had given him the vision which assured his success in the cattle business. He concluded by saying he felt so strongly about the mission of the Tulsa stock show, that he wanted the “privilege” of making the first contribution. He then plucked a crisp new hundred dollar bill from his shirt pocket, said “the first hundred dollars,” smiled, laid the bill on the table, and sat down. Sitting near the head table, I turned to see if I could read the reaction. Ray Gene Cinnamon had Tulsa’s elite in his pocket. There wasn’t a dry eye in the place. It was only left for Jay Walker to say, “Well, gentlemen, it couldn’t have been said any better. If you see the point of what we’re up to now, we need your checks or your pledges.’ In a very few minutes, some $68,000 was put on the table, a lot of money in 1947. The Tulsa Fat Stock Show and Exposition wasn’t broke any more. After the crowd had dispersed, I straggled into the cloak room in the corner of the mezzanine, and Jay Walker was there retrieving his topcoat. In a low voice, I told Mr. Walker he had done a great job of salting the mine. “Whatta you mean?” he looked at me quizzically. I told him heavens no, that I just wanted him to know there was a little skepticism left in his audience. Jay Walker walked out of the cloakroom grinning and shaking his head. A few days after this, I was standing at one of the AP tickers which was moving a story about an entrepreneur in Denver who had sponsored a big winter carnival-type event to which nobody came because of blizzard conditions. The only thing that had saved this fellow, according to the story, was weather insurance. I made a mental note of this, and at a subsequent meeting of the stock show planners in Mr. Skelly’s basement, I broke my usual silence and reported on the Denver showman’s experience, then asked if any consideration had been given to such insurance. Mr. Skelly looked at me with a strained tolerance, and declared such a thing would be a waste of money. He said they had looked back 20 years at conditions in the March time-frame when the stock show was scheduled, and the weather was always perfect, so there was nothing to worry about. Truth be told, W. G. Skelly just could not conceive that Providence or the elements would or could betray the city of Tulsa by spoiling an undertaking so important to its future. as the big opening day approached, everything had fallen into place. The epic (opening) day for Bill Skelly’s great outreach to farm youth of the Magic Empire and beyond was to be Friday the 13th of March. If that day means bad luck, it was sure set to justify its reputation this time! Nobody could remember anything like the great Oklahoma blizzard of 1948. Almost seven inches of snow fell on Wednesday, March 11. By Thursday morning it was gauged at more than l0 inches, but much of it had been driven by winds of nearly 70 miles per hour, and drifting was a major problem. The low early Thursday was in the teens. Following the snow came sleet and ultimately the ground layer was like packed ice. Everything in Tulsa closed – the refineries, businesses, schools, all local traffic, and inter-city buses. Three youngsters from Washington County, stalled with their pigs in a truck bogged in a snowdrift, and one had severe frostbite. Volunteers pitched in to see that the hardy youngsters who braved the storm had three hot meals a day. The judging went forward, and 4-H and FFA boys and girls took home more than $112,000 in prize money for stock shown and sold at the first — and last — Tulsa Fat Stock Show. Continuance of Bill Skelly’s dream depended on a large public turnout and a heavy gate at the turnstiles, but the crowds never materialized. As a fallback, the show’s officials thought attendance at the then popular Verne Elliott Rodeo, a highlight of the stock show, with the Lone Ranger himself a featured attraction, would be a big revenue generator. But the bitter cold kept the public away, even for this extravaganza. When the show was over and the thaw had come, the Tulsa Fat Stock Show was worse than broke, it was deep in the red. The blizzard of ‘48, so fierce in its biting ways, had killed Bill Skelly’s dream. One of the things I remember was, with two other reporters on phones gathering and passing on information, I wrote the story of the blizzard and its devastating impact. It was the only news story I ever wrote with an eight-column headline, page one. Three or four weeks after the death of the Tulsa Fat Stock Show, I ambled into the Skelly Building barber shop for a haircut. Mr. Skelly was just getting out of one of the chairs, and the barber asked him if they would try to hold the stock show in l949. “Really too bad,” the barber sympathized. “Yes, a big disappointment,” Mr. Skelly said. Then nodding in my direction, he said “This young fella thinks the weather broke us, but we really could have used better publicity.” With that, he winked at me and ducked through the door leading to the building lobby. It was a private joke, and as near as he would ever come to acknowledging that weather insurance wasn’t such a bad idea after all. While Bill Skelly’s dream of founding a major stock show in Tulsa died aborning in the great blizzard of 1948, just six weeks later his International Petroleum Exposition opened, playing to sellout crowds for ten days, and was a success by all standards. And I was thrust, unexpectedly, into the midst of the “Big Oil Show,” as the Tulsa World’s key reporter on the event. I took on that assignment a little bleary-eyed. End of Chapters Three and Four! Visit AOGHS for more chapters to be added in 2019. The Zero Hour Bomb Company was founded in Tulsa, Oklahoma, in 1932. Photos courtesy Zebco. When Jasper R. Dell Hull walked into the Tulsa offices of the Zero Hour Bomb Company in 1947, he carried a piece of plywood with a few nails in a circle wrapped in line. Attached was a coffee-can lid that could spin. Hull, known by his friends as “R.D.,” was an amateur inventor from Rotan, Texas. He had an appointment with executives at the Oklahoma oilfield service company. Since its incorporation in 1932, the Zero Hour Bomb Company had become well known for manufacturing dependable electric timer bombs for fracturing geologic formations. It had designed and patented technologies for “shooting” wells to increase oil and natural gas production. The company’s timer controlled a mechanism with a detonator in a watertight casing. The downhole device could be pre-set to detonate a series of blasting caps, which set off the well’s main charge, shattering rock formations. Hull’s 1947 visit was timely for Zero Hour Bomb Company, because post World War II demand for its electrically triggered devices had declined. With the military no longer needing oil to fuel the war, the U.S. petroleum industry was in recession. The company and other once booming Oklahoma service companies were reeling, and the future did not look good. Further, with company patents expiring in 1948, “the Zero Hour Bomb Company needed a solution,” explains Sills, digital editor for Fishing Tackle Retailer. After examining Hull’s contraption, a prototype fishing reel, the company hired him for $500 a month. Hull later received a patent that would transform Zero Hour Bomb Company – and sport fishing in America. Two patents in July 1953 for a well bridge would be among the last the Zero Hour Bomb Company received as an oilfield equipment manufacturer, thanks to a fishing reel designed by R.D. Hull in the late 1940s and patented on February 2, 1954. A 1953 design that took this concept even further would be the last patent Zero Hour Bomb received as an oilfield equipment manufacturer. By then, the earliest model of Hull’s new “cannot backlash” reel was attracting crowds at sports shows. “After trying to design ‘brakes’ for bait-casting reels, and even failing at launching one fishing reel company, Hull hit on a better way one day as he watched a grocery store clerk pull string from a large fixed spool to wrap a package,” reports Lee Leschper in a 1999 Amarillo Globe-News article. Zero Hour Bomb Company’s first “cannot backlash” reel made its public debut at a Tulsa sports expo in June 1949. Given his own Hull-desiged fishing reel at about age six, Leschper recalls the “tiny black pushbutton reel” came with 6 lb. monofilament line (a petroleum-based polymer), a four-foot white hollow fiberglass rod, and a hard yellow plastic practice plug. A Zero Hour Bomb Company package addressed to President Eisenhower was submerged in water by White House security in 1956. Photo courtesy Fishing Tackle Retailer magazine. Earlier, Hull, had tested several designs before developing a production process; the first reel was produced on May 13, 1949. Called the Standard, it made its public debut at a Tulsa sports expo in June. By 1954, the reel’s simple push-button system used today was introduced. The regional marketing name – Zebco – became popular, but the bottom of each reel’s foot was stamped with the the name of the manufacturer, Zero Hour Bomb Company. The official name change to Zebco came in 1956, soon after a friend of President Dwight D. Eisenhower asked the company to send a reel to the president. According to a Zebco company history, when White House security officers saw the package labeled “Zero Hour Bomb Company,” they plunged it into a tub of water and called the bomb squad. After changing its name to Zebco, the company left the oilfield for good. In 1961, Zebco was acquired by Brunswick Corporation and introduced the 202 ZeeBee spincast, “an instant classic.” After shifting reel assembly production to China in 2000, Brunswick a year later sold Zebco to the W.C. Bradley Company. Zebco headquarters today remains in Tulsa, where it leases a 200,000-square-foot warehouse and distribution center. Jasper R. Dell “R.D.” Hull was inducted into the Sporting Goods Industry Hall of Fame in 1975 after receiving more than 35 patents. At the time of his induction, 70 million Zebco reels had been sold. He retired from the former oilfield time-bomb company in January 1977 after being diagnosed with cancer and died in December at age 64. A New Jersey “oil well” drilled in 1916 was said to have found a previously unknown geologic oil-bearing formation. There would be no East Coast oil boom, despite enthusiastic promotions of a fake New Jersey oil well after a family in Millville decided to expand from real estate into oil exploration business on their farm in Cumberland County. As early as August 1916, a West Coast newspaper covered the unusual attempt to find oil East Coast oil. “Lewis Steelman, the man who has been prospecting for oil near Millville, N.J., for some time, has begun active work to locate an oil well and he confidently expects to strike the fluid,” reported California’s Santa Ana Register. “Steelman has secured options on the property in the vicinity of his estate at Cumberland, near here, and has erected a derrick 75 feet high, by which the drilling will be done,” the newspaper explained. Newspapers as far away as California reported the dubious New Jersey oil discovery. Dr. von Hagen also predicted this previously unknown geologic oil-bearing formation extended into Maryland and West Virginia, varied in width, “but is nowhere more than fifteen miles across.” Dr. von Hagen had spent two years in tracing it, the newspaper added. “Dr. von Hagen says he and his associates have received a $100,000 offer for the well which they are sinking, and from which they can get about fifteen barrels of oil a day, though the final depth has not been reached,” reported the Morning Herald. Dr. Von Hagan himself leased thousands of acres of land east of Millville, as well as nearby Hammonton. “The old timers called the woods road leading to the site Oil Well Road,” notes one Millville resident. Millville resident George Martin tracked down the abandoned New Jersey well. Steelman Realty, Gas and Oil Company stock certificates today are valued by collectors as remnants of a failed petroleum speculation scheme. “New Jersey Not a Good Field for Oil Investments,” concluded the April 1921 Oil Trade Journal. Home to major East Coast refineries, New Jersey has never produced commercial quantities of oil or natural gas. A Wildcatter’s Trek: Love, Money and Oil tells the story of one man’s adventure through the East Texas boom of the 1930s and beyond. For Texas oilmen like Gene Ames Jr., A Wildcatter’s Trek: Love, Money and Oil , reads more like fact than fiction. Plucked from the authentic experiences of Texas wildcatters, Ames’ recently-published novel follows the life and career of a young oil-field pipe salesman-turned-wildcat driller, who gambles on a hunch in East Texas and discovers the largest oil field in the world. Suddenly an unwitting player in the greedy, gritty world of big oil, this overnight oil magnate embarks on a page-turning journey through a minefield of great wealth, high-stakes gambling, and an insatiable drive toward the next major oil discovery. It’s a subject oilman/author Ames knows well. A fourth-generation wildcatter, raised in the East Texas oilfield, Ames braids first-hand oil industry insights into the dramatic tale of one wildcatter’s trek through spectacular booms and busts in business and in his tumultuous life. History, politics, geological science, technological advances and economic realities, provide a factual backdrop for the novel’s fascinating characters — many based on oil legends like Columbus “Dad” Joiner, Tom Slick, Clint Murchison, Hugh Roy Cullen and H.L. Hunt. The central character, Jordan Phillips, represents an amalgam of these early wildcatters — a fraternity of quiet, calculated drillers, who sealed high-stakes deals with a handshake and struck dry holes with a gamblers’ countenance. Gene Ames Jr., a managing partner of Compadre Energy, Ltd., continues seeking to acquire oil and gas fields, with bypassed undeveloped reserve potential while never stopping the search for unexplored giant frontier oil and gas reserve drilling prospects. Ames has served as chairman of the Independent Petroleum Association of America, where he received the Chief Roughneck Award in 1995, and the Texas Oil and Gas Association. He is on the board of directors and is a former chairman of the Southwest Research Institute in San Antonio. For more information or to interview the author, contact Nina Flournoy at npflournoy@gmail.com. It was big news in North Texas when a wildcat well discovered an oilfield on S.L. Fowler’s farm on July 29, 1918. A drilling boom along the Red River would soon make Burkburnett world famous. Over The Top Oil Oil Company wanted in on the action. ‘‘Land values in and near town took a jump at once and all available land in and near that townsite has been either leased or offers have been made upon same,” reported the Burkburnett Star. Over The Top Oil Oil was one of dozens of speculative ventures that quickly followed up the discovery. About 60 drilling rigs were at work within three weeks of the strike. By June 1919, Burkburnett, Texas, had more than 850 producing wells in “the world’s wonder oilfield.” Twenty trains ran daily between the town and nearby Wichita Falls. Six months later, Burkburnett’s population had grown from 1,000 to 8,000. A line of derricks two-miles long greeted visitors. With few skilled petroleum engineers, the rush to tap into oil wealth ignored reservoir management and conservation techniques. The Over The Top Oil Company was among those in a rush. Nonetheless, Over The Top Oil Company brought in a small producer in March 1919 – the No. 1 McKinney at 300 barrels. It was before overproduction, reduced reservoir pressures, and shrinking margins took their toll on Burkburnett. A popular 1940 MGM movie was based on the 1918 Burkburnett oilfield discovery. Although Over The Top Oil Company remained in the American Oil Directory of 1922 at the same Wichita Falls address, no further drilling was apparently made and references fade from records. The Texas Railroad Commission maintains an archive of oil well records and may be able to assist with deeper drilling into the history of Over The Top Oil Company. Learn more in North Texas oil history in Boom Town Burkburnett and Texas Production Company. “Give Texas more Rangers of the caliber of ‘Lone Wolf’ Gonzaullas and the crime wave we are going through will not be of long duration,” reported the Dallas Morning News in 1934. By September 3, 1930, when the Daisy Bradford No. 3 well near Kilgore first tapped the great East Texas oilfield, he was already known as “El Lobo Solo.” Gonzaullas brought his own methods for enforcing law and order. Manuel Trazazas Gonzaullas was born in 1891 in Cádiz, Spain, to a Spanish father and Canadian mother who were naturalized U.S. citizens. At age 15 he witnessed the murder of his only two brothers and the wounding of his parents when bandits raided their home. Fourteen years later, he joined the Texas Rangers. David Rance collects slide rules, those analog calculating devices that became obsolete when electronic pocket calculators hit the market in the early 1970s. He hopes someone will know something about a rare one from a refinery supply company. David’s Calculating Sticks website offers historical insights about the calculating devices, including details on the more than 550 slide rules in his collection. In August 2016, he emailed images of his 10-inch wooden slide rule, which has “Refinery Supply Company” and “AC-ME Pocket Calculator” printed on its back. “Sadly, like the one in the MIT collection, it came without any documentation and despite my best efforts, I still know very little about its provenance,” he wrote, referring to the Massachusetts Institute of Technology’s museum. The Refinery Supply Company of Tulsa and Dallas, “appears to have a rich history as a major supplier/reseller,” notes collector David Rance of the Netherlands. The slide rule is “the iconic instrument of the engineering profession,” according to the MIT Museum in Cambridge, Massachusetts. “Every significant human-built structure of the past 150 years has involved its use.” Among the world’s top science and engineering universities, MIT was founded in 1861 – just two years after the first U.S. commercial oil well launched the oil and gas industry. The supplier, the Refinery Supply Company of Tulsa (and Dallas), “appears to have a rich history as a major supplier/reseller, notes Rance. “I believe ‘AC-ME’ refers to the aptly named ‘AC-CURATE ME-ASUREMENT PRECISION INSTRUMENTS’ Company, possibly once based in Piqua, Ohio,” he adds. Refinery Supply Company of Tulsa was established in 1923 – but today cannot locate information about its old slide rule. Adding to the mystery is that the slide rule was made in Germany, Rance says. “A more natural choice would have been one of excellent U.S.-based slide rule makers such as Keuffel & Esser Company. So it begs the question, why would a Tulsa-based supplier import such an item? Comment below if you would like to share some information about this slide rule. The Kansas petroleum industry began in 1892 with an oil discovery at Neodesha. Later discoveries near Wichita revealed the giant Mid-Continent field, but it took years for business sense to arrive, according to the editor of a 1910 History of Wichita and Sedgwick County, Kansas. Although Wichita and Sedgwick County’s economies would remain dependent on farming and ranching, the age of oil soon began. In 1915, the Wichita Natural Gas Company, a subsidiary of Cities Service Company, drilled with a cable-tool rig on the John Stapleton farm northeast of town. The company’s Stapleton No. 1 exploratory well (at a site chosen using the emerging science of petroleum geology) struck oil and launched a true Kansas oil boom. Wichita Oil & Gas’ drilling fortunes depended on a portable Star Drilling Machine, a cable-tool drilling technology. The company leased land south of Wichita – just southeast of the Kansas City, Mexico and Orient Railroad station at Schulte, Kansas. Despite claims of a “2,000 acre lease around the town,” all Wichita Oil & Gas drilling would take place within a 500-foot radius of a spot on the 319-acre Folkers farm. (The well site was in Section 17, Township 28 South, Range 1 East.) After many months of making hole, the company updated its investors in November 1916. Wichita Oil & Gas Company drilled southeast of the train station at Schulte, Kansas, in 1916. About 50 miles away, citizens of Anthony had gathered in 1902 to celebrate the driving of the first spike on the Kansas City, Mexico & Orient Railway. Photo courtesy Kansas Historical Society. For “poor boy” companies with limited capitalization like Wichita Oil & Gas, the costs of continued drilling were often financed through increased stock sales and hyperbole. Accurate newspaper accounts were rare. One Wichita Oil & Gas executive appealed to potential investors on Christmas Eve in 1916. But when its well failed to find oil, the company relocated the cable-tool rig and tried again nearby. This well, the Folkers No. A 1, was plugged and abandoned after reaching a depth of 1,404 feet. The search for investors and loans continued even as drilling reports from the company began to dwindle. A decline in stock sales and financing woes may help explain the intermittent reporting. Ultimately, the Kansas Attorney General launched a suit against Wichita Oil & Gas Company. It was the end of Wichita Oil & Gas Company. The Kansas Geological Survey notes the Folkers farm well site drew new drilling activity even after Wichita Oil & Gas had failed. On May 12, 1919, White Oil Corporation spudded a well not far from the last dry hole drilled by Wichita Oil & Gas, but it had no better luck even 3,400 feet deep. Few newly formed oil exploration companies would succeed in the risky wildcatting of the Mid-Continent (see Otter Creek Oil & Gas Company, formed by three Wichita businessmen). Oil fever also reached southeastern Kansas, where Missouri investors saw opportunities in 1904 and organized the Cahege Oil & Gas Company. Two years later, the boom town of Caney made headlines – and attracted tourists with a Kansas gas well fire that at night could be seen for miles. In Memoriam: Charles W. Cookson, founder of the American Oil & Gas Reporter, who died July 17, 2015, in Wichita, Kansas. A true leader in petroleum industry journalism, “Cookie” Cookson, founder and publisher emeritus of The American Oil & Gas Reporter, died July 17, 2015, in Wichita, Kansas. He was 92. Together with his wife Joyce, he founded the industry trade magazine in 1958. He was inducted into the Butler County History Center and Kansas Oil Museum’s Legacy Gallery in 2010. Deepest condolences to the Charles W. Cookson family from all of us who had the privilege of reporting on the oil patch for him. Visit In Memory of Charles W. “Cookie” Cookson. Among those who have served on the editorial staff at The American Oil & Gas Reporter with founder Charles W. “Cookie” Cookson (center) are, from left, Bruce Wells, Alex Mills, Bill Campbell and A.D. Koen. Cookson is holding the artist’s proof of a limited edition print, “Donkey in a Kansas Field,” by California artist JoAnn Cowans. It was presented to him by the American Oil & Gas Historical Society, which honored Cookson with its first Oil History Journalism Award in April 2006. Wells founded AOGHS in 2003 and continues to serve as its executive director. Mills is president of the Texas Alliance of Energy Producers; Campbell remains with The American Oil & Gas Reporter as managing editor; and Koen is an independent energy writer and communications consultant in Houston. Photo courtesy of The American Oil & Gas Reporter. The historical society’s 2015 calendar offers industry milestone dates with 12 historic oil patch photographs from the Library of Congress. The 2015 petroleum history calendar by the American Oil & Gas Historical Society has been printed. Today in American Petroleum History – which included dates with descriptions of petroleum history milestones, technologies, inventions, oilfield discoveries, pioneers, etc. Please call fax or email this easy order form. The special energy education calendar, printed in partnership with the Texas Alliance of Energy Producers, launches an annual project useful for energy workshop programs, association members, teachers, students and employees. Each month offers historical facts along with one of 12 Library of Congress oil patch photos from the 1930s. Beginning in 2016, the industry’s milestone dates will be available in editions customized for companies, museums and other industry organizations. The petroleum history calendar is an inexpensive energy education resource. Depending on the number ordered, the price per 11 inch by 17 inch calendar is as low as $5 each. Please contact Bruce Wells at bawells@aoghs.org. Help AOGHS promote the Today in American Petroleum History 2015 calendar using this news release.